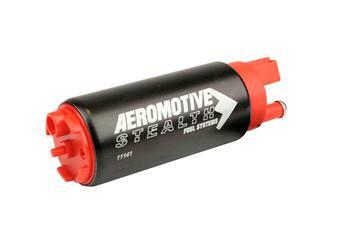 Aeromotive Fuel Pump - 340 Stealth Pump UNIVERSAL - Lesher Motorsports, Inc. The Aeromotive 340 Stealth Pump is a high output, in tank electric pump that fits most of the popular late model EFI applications. Lightweight and compact, the unit bolts directly in to most exiting hanger assemblies. The Aeromotive Stealth 340 has superior flow throughout a wide pressure range. The 340 has over 30% more flow than stock pumps and is perfect for applications that demand more flow while keeping the existing stock wiring. The Aeromotive 340 Stealth Pump fills the need for increased flow when power adders or engine modification are made that leave the engine demanding more fuel flow. Fits most vehicles where a Walbro 255 is applicable. 3 inlet configurations cover a wide range of vehicles. Designed for in-tank use with O.E. fuel systems.